After a tragic car accident, Samantha is left widowed and bereft. Her husband Adam was everything to her. But at least the home they shared together in Cornwall provides her with some security. Or does it? Upon returning from a school reunion in Sheffield, where Sam met her old friend, Penny, and an old flame from her school days, Dan, she discovers that Adam had invested money unwisely and she is now penniless. When Penny and Dan, who are now married, arrive in Cornwall to visit Sam, Dan comes up with a way in which Sam can keep the house. He suggests she turns it into a writing retreat. And he is willing to invest. Despite his wife’s reservations, Dan gets his way but at what price? Why is Dan so keen to help? Has Sam put herself in harm’s way? Some relationships are built to last. Others are deadly. 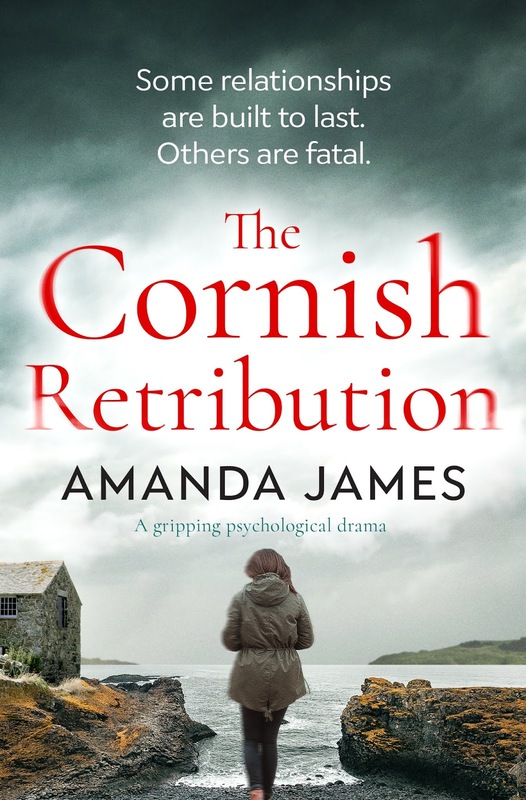 I am a huge fan of Amanda James books; not only are you guaranteed a gripping and suspenseful storyline but the dramatic Cornish landscape is woven into the story as if it's a character in its own right. 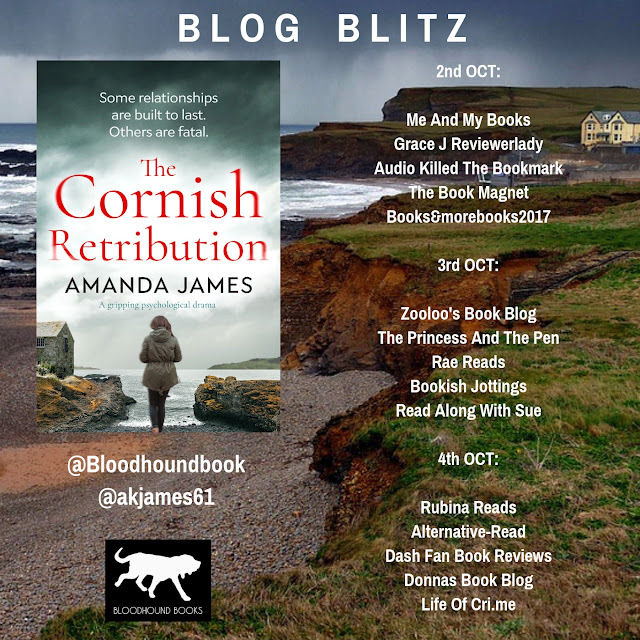 I have never been to Cornwall but it's definitely somewhere I want to visit after reading Amanda James' fabulous books. I loved the story of Sam going to her school reunion, the thought of which gives me goosebumps as everyone tries to compete to see who has become the most successful. Recently widowed, Sam makes the decision to go up to Sheffield to face her demons in the form of old flame Dan and ex-best friend Penny who are now married. I could feel the sexual tension between Dan and Sam as the years seemed to melt away as if they were teenagers again, then the temperature plummets when Penny arrives on the scene. Despite their tempestuous history, which they all seem willing to forget, Sam decides to let Dan and Penny invest in her writing retreat...but is this a decision she will regret? I really worried for Sam as I felt as if she was a fly caught in a spider's web with so much suspense and tension written into the story. Dan seemed too good to be true, swooping in like a knight in shining armour to rescue Sam's home, but I feared he had an ulterior motive. The whole story had me balanced on a knife edge as it spun off in different directions and I wondered who would be left standing at the end. 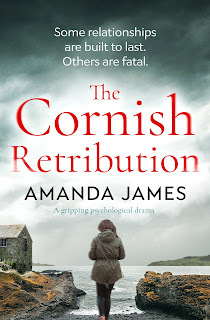 I am never disappointed by Amanda James books and The Cornish Retribution is no exception. 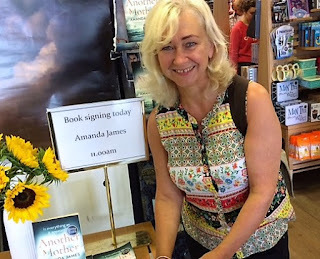 In fact, I think it is one of my favourite Amanda James books; it's suspenseful, gripping and utterly engrossing. A highly recommended read. Amanda has written since she was a child, but never imagined that her words would be published, given that she left school with no real qualifications of note apart from an A* in how to be a nuisance in class. Nevertheless, she returned to education when her daughter was five and eventually became a history teacher. Then in 2010, after many twists and turns, the dream of becoming a writer came true when her first short story was published. Amanda has written many short stories and has six novels currently published. Amanda grew up in Sheffield but now has realised her lifelong dream of living in Cornwall and her writing is inspired every day by the dramatic coastline near her home. She has sketched out many stories in her head while walking the cliff paths. Four of her mystery/suspense novels are set there, Somewhere Beyond the Sea, Summer in Tintagel, Behind the Lie and Rip Current. The Cornish Retribution is also set in Cornwall and will be published by Bloodhound Books in October 2018. Amanda, known to many as Mandy, spends far more time than is good for her on social media and has turned procrastination to a fine art. She can also usually be found playing on the beach with her family, or walking the cliff paths planning her next book.